A GOS boar helped the British war effort in 1914. The German Kaiser had ordered and paid for a fine specimen in 1914 but the First World War broke out just before it could be exported and it was never sent. There was no record of the payment being returned, however. The Gloucestershire Old Spots Breed Society was formed in 1913. The originators of that society called the breed ‘Old’ Spots because the pig had been known for as long as anyone could remember. 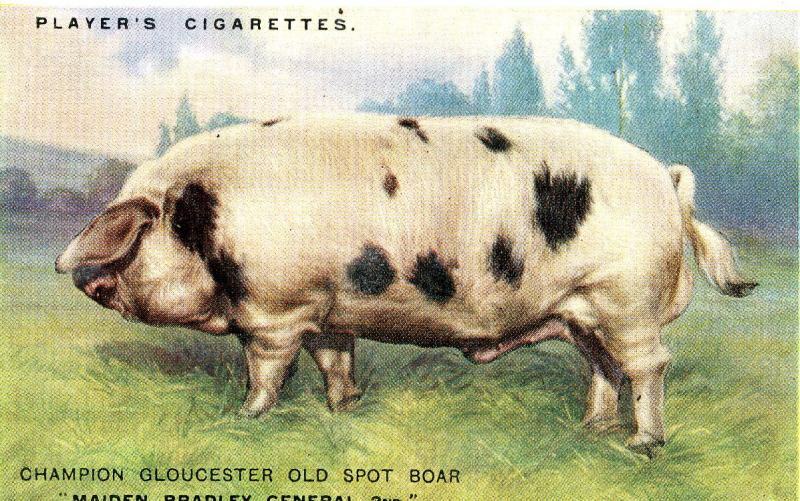 The first pedigree records of pigs in the UK began in 1885, much later than they did for cattle, sheep and horses because the pig was a peasant’s animal, a scavenger, and was never highly regarded. No other pedigree spotted breed was recorded before 1913, so today’s GOS is the oldest such breed in the world! The breed originated around the Berkeley Vale on the southern shores of the river Severn in south west England (click here for more detail Map showing Foundation herds with Boars). It was usually kept in the cider and perry pear orchards of the area and on the dairy farms. Windfall fruit and waste from the dairies supplemented its grazing habit. Local folklore says that the spots on its back are bruises from the falling fruit. Besides its correct title and variations such as Gloster Spot or just Old Spot, the breed is also known as The Orchard Pig and The Cottager’s Pig. Little is recorded of the breed’s development but Victorian writers such as William Youatt in ‘The Pig’ and HD Richardson in ‘The Pig – Its Origins and Varieties’ seem to conclude that it was derived from crossing the original Gloucestershire pig – a large, off-white variety with wattles hanging from its neck, with the unimproved Berkshire, a sandy-coloured prick-eared pig with spots. This is reinforced in William Marshall’s ‘The Rural Economy of Gloucestershire’ ca.1780 and ‘The Complete Grazier’ by a Lincolnshire Grazier of 1816, among others. See also 100 Years of Porcine Perfection.